When it comes to video games, I tend to prefer cute, quirky and whimsical ones to those that are more realistic or serious. When it comes to movies, though, I tend to prefer those that are tense and scary to almost anything else. Seriously, I've been a horror-film buff since I rented and watched a VHS tape of the first Nightmare on Elm Street as an early teen. For whatever reason, my interest in scary movies has rarely translated to me playing scary games. That's not because I think the latter are unappealing, mind you. Actually, I've found a ton of scary games intriguing over the years. Almost every time I start one, however, I quickly become overwhelmed to the point that I have to turn the damn thing off. A relevant case in point: the original, Super Famicom version of Human Entertainment's Clock Tower. I've tried to play this point-and-click survival-horror game on multiple occasions. Unfortunately, each one ended rather abruptly--usually around the first time the series' unimaginatively named antagonist, Scissorman, shows his face and grotesquely (some might say comically) massive weapon of choice. Say what you will about my inability to deal with those scissor-on-girl encounters, but the fact remains that trying to run away from a murderous maniac using a cursor controlled by a directional pad is stressful--or at least it has been for me. 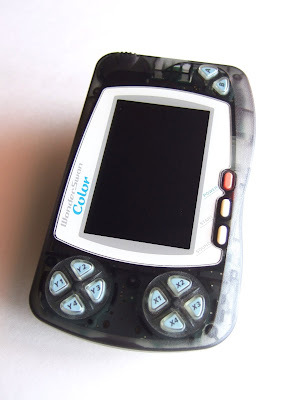 Is that still true with Clock Tower for WonderSwan? 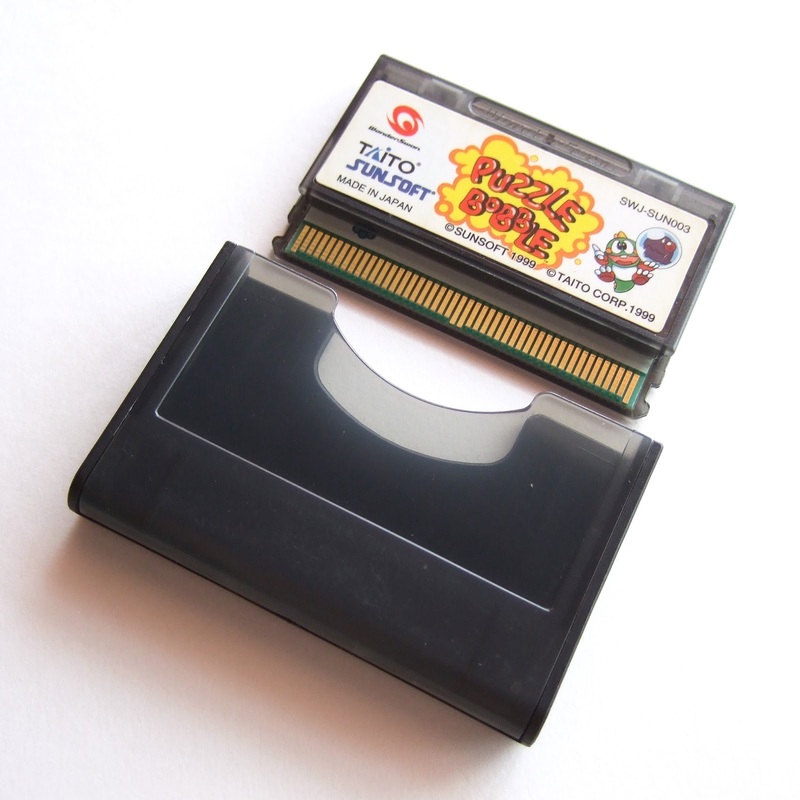 (That's the full title of this port, by the way. 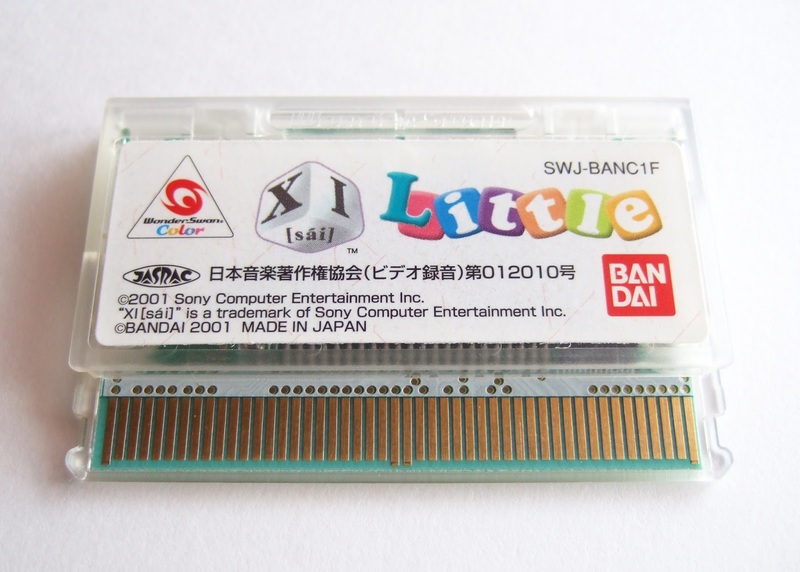 For whatever reason, a lot of game publishers followed that same naming convention while prepping ports of games for Bandai's oddball handheld.) Yes and no. Don't get me wrong, this portable version of Clock Tower freaks me out every bit as much as its console counterparts did and continue to do. I've done my best to get over that, though, so I can write the post you're reading right now. 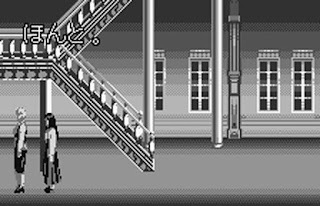 * This iteration of Clock Tower was made for the original WonderSwan system, so it's in black and white rather than in color like its Super Famicom and PlayStation predecessors. * A company called Kaga Tech developed it. To be honest, I'd never even heard of Kaga Tech before I started doing research for this write-up. Is or was the company at all related to Kaga Create, which produced titles for everything from the Famicom to the Saturn, or that outfit's parent firm, Kaga Electronics? I believe so, as Naxat (Soft) published this port, and Naxat was the public-facing name of Kaga's gaming devision. 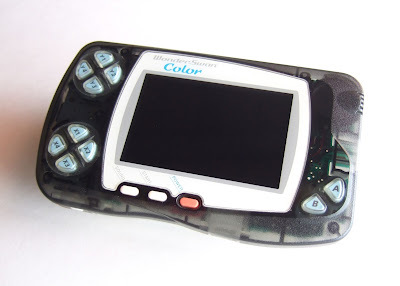 Regardless, GameFAQs tells me Kaga Tech at least made a bunch of WonderSwan games as well as a few for the GameBoy, GameBoy Advance and PlayStation during its heyday. 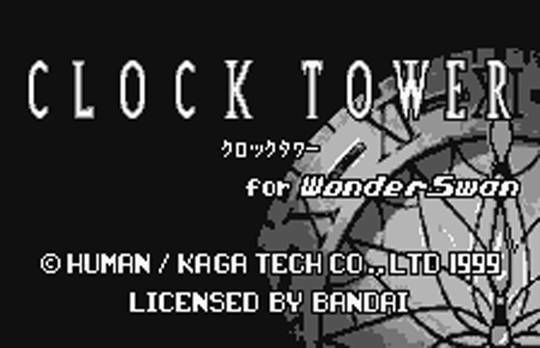 * As far as I can tell, Clock Tower for WonderSwan is a shockingly faithful conversion of the 1995 original. Some concessions were made so the game could run on WonderSwan hardware, of course--such as the aforementioned lack of color, a lower resolution and a minimalist head-up display (more on that last one in a second)--but besides those, everything else seems to be in place. Don't take that last bullet point to mean this handheld iteration of Human Entertainment's cult classic is near-perfect. It's not. That alone will be a deal-breaker for some, I'm sure. For me, it's mostly been an occasional annoyance. Usually, I'm fine with it; at other times, I daydream about my Clock Tower cart suddenly igniting and melting into a pool of unrecognizable goo. 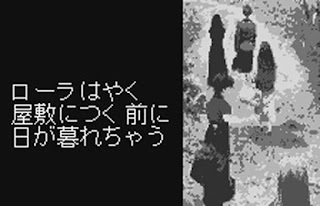 Regardless, Clock Tower for WonderSwan's slowness is a shame, as every other aspect of the game is captivating. OK, so at first I didn't like that it no longer displays Jennifer's portrait, which in the Super Famicom and PlayStation versions depicts the orphan girl's stamina and stress levels. After a bit of reflection, though, I decided Kaga Tech's (or Naxat's, if you prefer) substitution--three dots along the edge of the screen that appear and disappear depending on how worked up Jennifer is or isn't--is perfectly serviceable. I'm also now a big fan of how Clock Tower of WonderSwan progresses. Following a brief intro, you (as Jennifer) are left alone in the titular mansion. Silence surrounds you. The only sounds you hear are those of Jennifer's feet walking along wooden and carpeted floors. That is, until Scissorman makes his first appearance. Then both background music and panic kick in, and the race to find Jennifer's fellow orphans and escape their supposed new home begins. I've yet to accomplish that last task, and I have a feeling I'll need to refer to a guide to do so, but I'm perfectly OK with that. 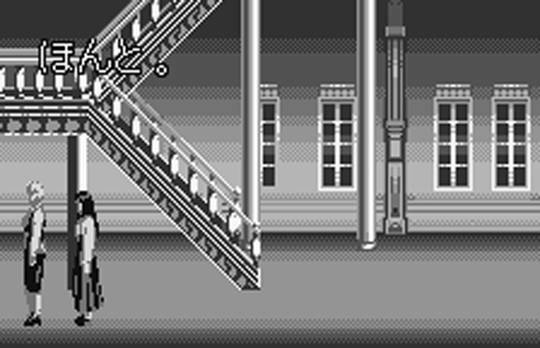 In the meantime, I'm getting a kick out of exploring Clock Tower--both the mansion in particular and the game in general--while also trying to avoid or fend off the incessant Scissorman, and I don't see that changing anytime soon. Are any of you Clock Tower fans? 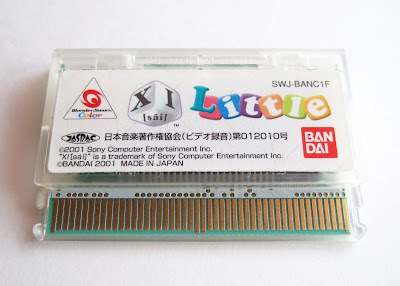 If so, have you experienced this WonderSwan release? Regardless, please share your thoughts and opinions on those topics or anything I've said here in the comments section below. 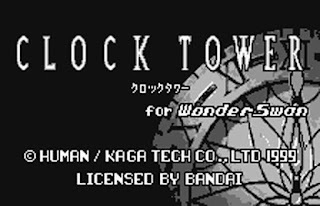 Also, if you'd like to see photos of Clock Tower for WonderSwan's box and cartridge, you can do so via this Flickr photo album of mine.